Welcome to the Math Salamanders 5th Grade Multiplication Fact Sheet collection. 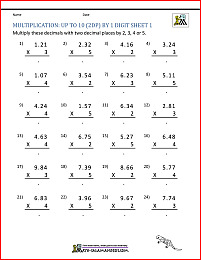 Here you will find a wide range of free 5th Grade Math Worksheets, which will help your child learn to multiply decimals by single digits mentally. 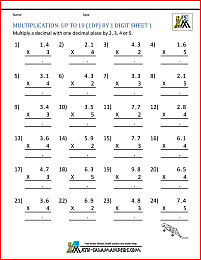 Here you will find our selection of Fifth Grade Multiplication Fact worksheets designed to help your child improve their ability to use their multiplication table facts to answer related questions. The sheets are graded so that the easier ones are at the top. learn to use their multiplication table facts to mentally multiply two decimals together. 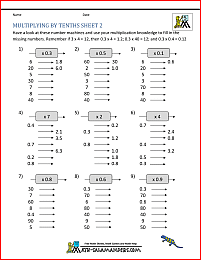 All the free 5th Grade Multiplication Fact sheets in this section follow the Elementary Math Benchmarks for Fifth Grade. Here you will find a range of Free Printable Multiplication Games to help kids learn their multiplication facts. Using these games will help your child to learn their multiplication facts to 5x5 or 10x10, and also to develop their memory and strategic thinking skills.